The farm stand of Jim and Annie Schultz's Red Shirt Farm on Route 7 in Lanesborough, Massachusetts, a member of Berkshire Grown. Note from Barbara Zheutlin, Executive Director of Berkshire Grown: The Berkshires are much loved for the pastoral beauty of the region. This gorgeous landscape attracts visitors and development, producing a rich culture, while simultaneously raising the cost of land. The high cost of land is one of the many challenges facing farms, the farms that are at the heart of the beauty of the Berkshires. So a challenge to all who treasure the Berkshires is how to sustain the old and new farms of the region that make the Berkshires extraordinary. In this series you will “get to know your local farmers,” the individuals who grow the food you eat and care for the land you see. Lanesborough — The long driveway of Red Shirt Farm takes you away from Route 7 and over a rise onto the land of farmers Jim and Annie Schultz. 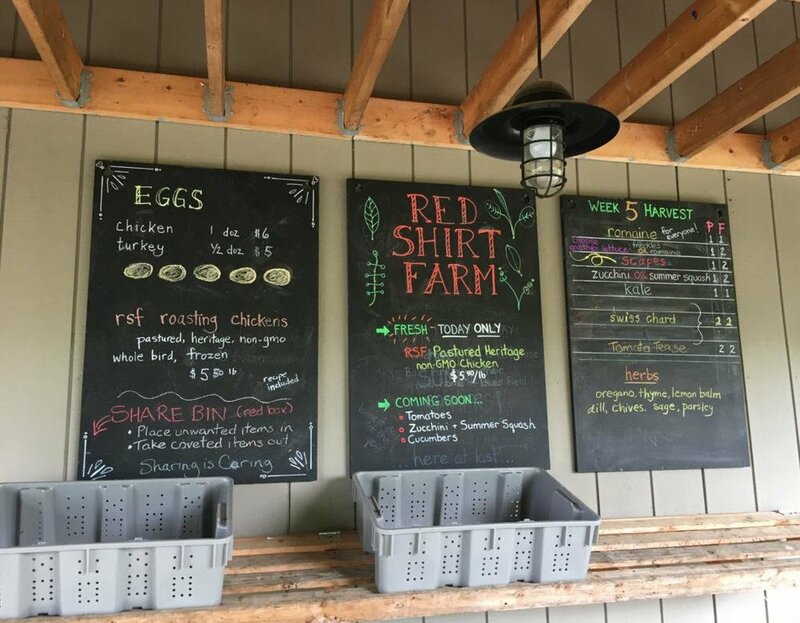 Located just north of Pittsfield, it is a thoughtful, family-owned farm that holds, as Jim says, “animal welfare, the local food system and sustainability” in high esteem. The drive ends at a lovely cinnamon- colored home, surrounded by their 10-acre parcel of land. Close to the house is a small building where people pick up their weekly CSA share. Large vegetable plots and a few greenhouses prominently ring the yard until the land slopes down into field. Jim greets us wearing a broad, welcoming smile, glasses, heavy-duty khakis, and, yes, a red shirt. generally plan on three years from opening a plot “until it hits its stride.” The use of homemade compost, mulch, and cover crops all help maintain the integrity of the soil. In addition, each bed is shaped by hand. There are a few advantages to this approach. Using broad forks and other hand tools means low-till beds and less soil compaction from machinery. The soil is loosened without causing damage and, as Jim points out, many worms are spared, as well. Also, working on a “human scale” is not only better for the earth, it saves on space. While the tractor is put to good use moving compost and wood chips, not allocating room for it in the garden allows for rows to be planted closer together, thus a higher crop yield in a smaller area. Before moving on, he emphasizes another important aspect of agriculture at Red Shirt Farm. Gesturing toward a row of plants closest to the nursery wall, he says, “We need to educate people about the use of the word organic.” Instead of spraying herbicides or pesticides of even the organic variety, the farmers hand-pick potato beetles and other bugs from vegetation. Many, many hours a week are spent taking personal care of the plants, from pest management to pruning and beyond. Jim and Annie are eager to educate people about how they grow their crops. And why shouldn’t they be? Using innovative ideas and a “back to the earth” mentality, they maximize space and maintain the integrity of their soil and vegetables. This attention to care extends to the farm’s heritage breed chickens, turkeys, pigs and bees. Heading to visit the chickens, we leave the greenhouse and walk past a large garden that boasts beautiful rows of lettuces and other vegetables. At the far end, a fence divides the yard from the incline of the field, which we venture down to reach the chickens at the bottom. The two breeds, Buckeyes and Australorps, are each pastured in their own large runs. The mobile “coops” house food and perches and allow the birds to be moved about the field frequently for fresh grazing. Similarly, the pigs are housed in a “wagon wheel” type of enclosure, so that they can be offered new pasture while their previous section is regenerated. While talking about the livestock, Jim seems just as passionate as he does about the vegetables. “We’re trying to bring flavor back,” he says, explaining why the farm raises heritage breeds – older breeds of livestock that have largely fallen out of favor in the age of industrial agriculture. They take longer – and thus are more expensive – to raise, but they produce more flavorful meat and certain breeds are a better fit for our New England landscape. Jim expresses the importance of “getting animals suitable to the environment...this environment,” noting that, ironically, the way to bring back endangered breeds is to eat them, which creates demand for farmers to continue raising them. At Red Shirt Farm, the preservation of heritage breeds and heirloom vegetable varieties alike is highly valued. solar panels installed on the farm. radiant heat is the next step toward being able to grow throughout the winter. It would also be a much more efficient and financially practical way to warm their chicken brooders. Considering those aspects when deliberating where the funds go only makes sense. It is another example of how at Red Shirt Farm, awareness, balance and sustainability are prioritized across the board. Red Shirt Farm products are available through their CSA and at the Dalton Public Market. Learn more at www.redshirtfarm.com.